Properties: Well......its blue. And a very pretty blue at that. And it is more durable and longer wearing than almost any other gemstone or mineral on the market. 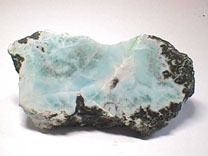 Sometimes called pectolite (I think larimar sounds a lot more romantic) this stone is cut into cabochons and carved into shapes for setting to a variety of jewelry items throughout the Caribbean islands. Its a must buy if you are planning a cruise any time soon. © 2011 YourGemologist.com and Robert James FGA, GG. All Rights Reserved. No part of this website may be copied, duplicated, distributed or posted to another website without the expressed written consent of the copyright holder.